Geometric or Abstract Decorative Shaving Mugs: These mugs will have the owner’s name and be decorated with geometric designs or abstract decorations. 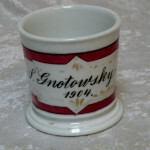 They are not considered very rare or desirable and are at the low end of the value range or Decorative mugs. 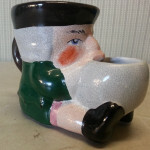 Cartoon or Comical Decorative Shaving Mugs: These are mugs that feature cartoony style illustrations on them, some of the common designs you will see are mugs with the caption “A Close Shave” with an image of a woman shaving a man, or two stereotyped black men fighting with razors. Other common Cartoon designs include Frogs, Rabbits, or Monkeys in various humorous scenes. Many of these mugs don’t have a personalized name on them. Pretty Woman Decorative Shaving Mugs: These mugs usually have a portrait style illustration of a Victorian woman, these mugs are usually decals that were embellished by the decorator. Children Decorative Shaving Mugs: Mugs with children playing in various scenes. Scenic or Landscape Decorative Shaving Mugs: Mugs that feature relatively generic scenes with a farm, forest, lake scene or other bucolic or pastoral setting. These generally do not depict people doing an activity that could be construed as an occupational. Drape Decorative Shaving Mugs: These mugs are sometimes confused for an undertaker’s occupational, but there are several varieties of this mug that are really just drapes decorating the mug. Birds, Butterflies, Horse Heads Decorative Shaving Mugs: There are many decorative mug designs that feature these types of themes, horse head mugs are sometimes confused for occupationals, but occupational mugs will almost always feature a full bodied image of a horse, while a decorative will have horse heads only. Patriotic or Flag Decorative Shaving Mugs: These mugs feature nationalistic symbols like Eagles, Flags, Shields with stars and stripes, there are often non-US mugs featuring clovers and harps for Ireland for example.